The Pride Center typically has 1 full-time Coordinator, and 4-5 student assistants. During the early 1990's, Cal Poly Pomona underwent a cultural and institutional shift that sparked a renewed sense of activism, particularly with students of color. Influenced by the cultural politics of the time, students began to ask for more supportive service that reflected and affirmed their identity. 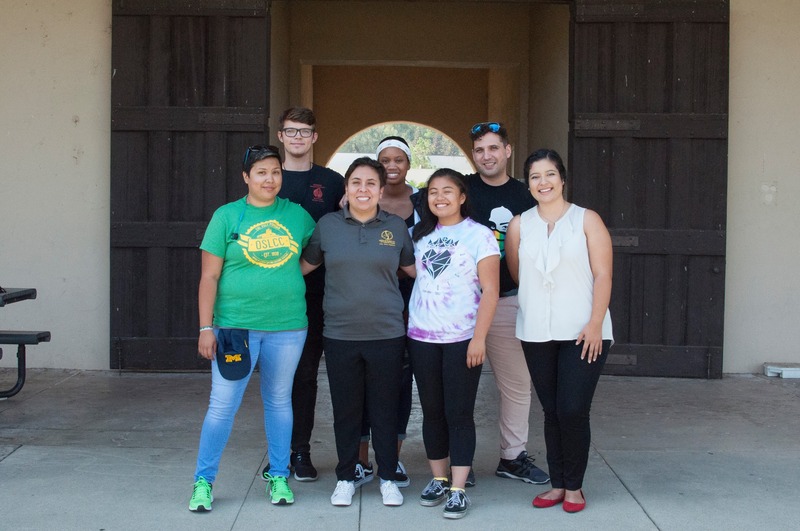 Soon after began a long process of opening a new multicultural center at Cal Poly Pomona. With students of color and allies leading the fight, a planning committee was formed and the vision of a cultural center began to crystallize. Unfortunately, the original planning did not include a space for the gay and lesbian group (GALA). A few students questioned this and several of them demanded to speak with project leaders in administration, including former VP for Student Affairs, Dr. Awakuni. After numerous meeting, the project leaders decided to include a small space for a gay and lesbian resource center that would be connected to the ReEntry & Women's Resource Center (formerly The Center). Jonnie Owens, advisor to GALA, volunteered her time to coordinate the gay & lesbian resource center while other center were assigned half-time appointed coordinators. After some initial growth that included new student assistants, the center officially opened in spring 1995 as the Gay, Lesbian, Bisexual Student Resource Center. After some consideration, the center was re-named The Pride Center. In 1997, Jonnie Owens was appointed as full-time coordinator of the Pride Center which also marked the first full-time position for a LGBT resource center in the California State University system. In February 2004, Jonnie Owens accepted a new position on campus, and Reyes Luna took over as Interim Coordinator until fall of that year. Fernando Estrada was hired full-time as Coordinator in September 2004. In October 2008, Jami Grosser took over as the Coordinator of the Pride Center. In 2012, due to budget shortfalls, Jami was appointed to also be the Interim Senior Coordinator for Cultural Centers in addition to coordinating the Pride Center. In order to continue services at the center, Shae Maile was hired as a part-time Program Coordinator in July 2012. Amanda Desmuke took over as the Program Coordinator in March 2013 and continued in that role until June 2014. Jami was made the permanent Senior Coordinator for Cultural Centers in May 2014. Manuel Diaz was hired as the Interim Pride Center Coordinator in November 2014 and served in the role until June 2015. Bri Sérráno was hired as the permanent Pride Center Coordinator in October 2015.